Sculpture in Stone (MFA), no. 276; Sculpture in Stone and Bronze (MFA), p. 113 (additional published references). The inscription on the architrave of the architectural frame (naiskos), of standard Attic imperial form, reads as follows: (add Greek) (“Sosibia, daughter of Eubios, from Kephissia”). Sosibia stands, nearly facing, and wears an Isiac costume of long tunic or chiton and knotted cloak or himation. 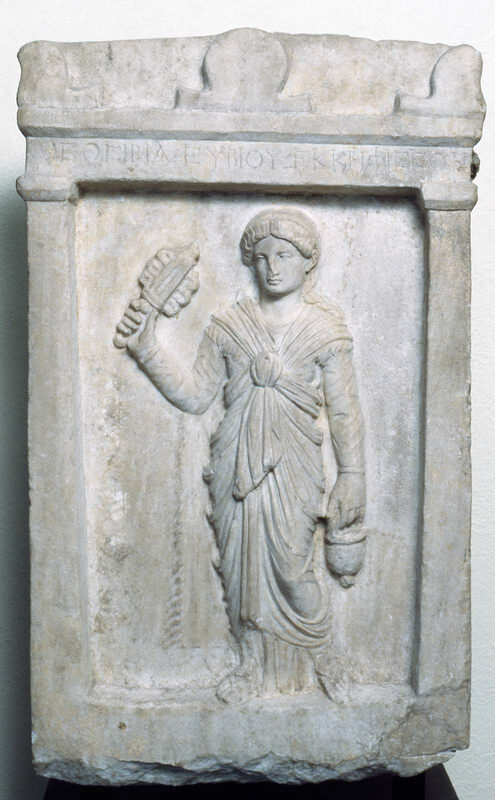 She holds a musical rattle (sistrum) in her raised right hand and a bucket (situla) in her lowered left. The stele has been chipped visibly on its architectural framework; otherwise it is in excellent condition. There is some incrustation on the surfaces. The letter forms of the inscription suggest a date in the second century A.D. Sosibia’s hair belongs to the time of Marciana, sister of Trajan (see under no. 16.286). “The closely-knit folds in the bulging drapery of the toga figures on the Philopappos monument are only occasionally to be found on stelei. Although the Isiac costume and attributes are standard, the coiffure can be termed “fashionable” for its period. Ladies so dressed and with these attributes were presumably interested in the cult of Isis, but they were not necessarily priestesses or even extravagant devotees. This is one of the better survivors among the Attic imperial stelei of its class, single figures of the early second century A.D. in an architectural enframement. Sosibia is shown as a devotee of Isis, the Egyptian goddess. She holds a sistrum (a ritual rattle) and a bucket of sacred Nile water. Her mantle, with its fringe and central knot copies that of Isis herself. During the Roman period, the cult of Isis was highly esteemed at Athens by members of the prosperous middle class. Harvard Lab No. HI1531: Isotope ratios - delta13C +2.56 / delta18O -8.92, Attribution - Pentelikon, Justification - Fine grained marble.